Reserving a room block for your next big event be it a wedding, Bar/Bat Mitzvah, anniversary, family reunion, or even a conference is the best way to ensure that your guests have a place to stay by your venue and at a discounted rate! Doing a block booking gives you all sorts of deals like free wifi, parking, discounted room rates for your guests or even a free room for the wedding/anniversary couple or conference chair person. Here is everything you need to know to complete a block booking. 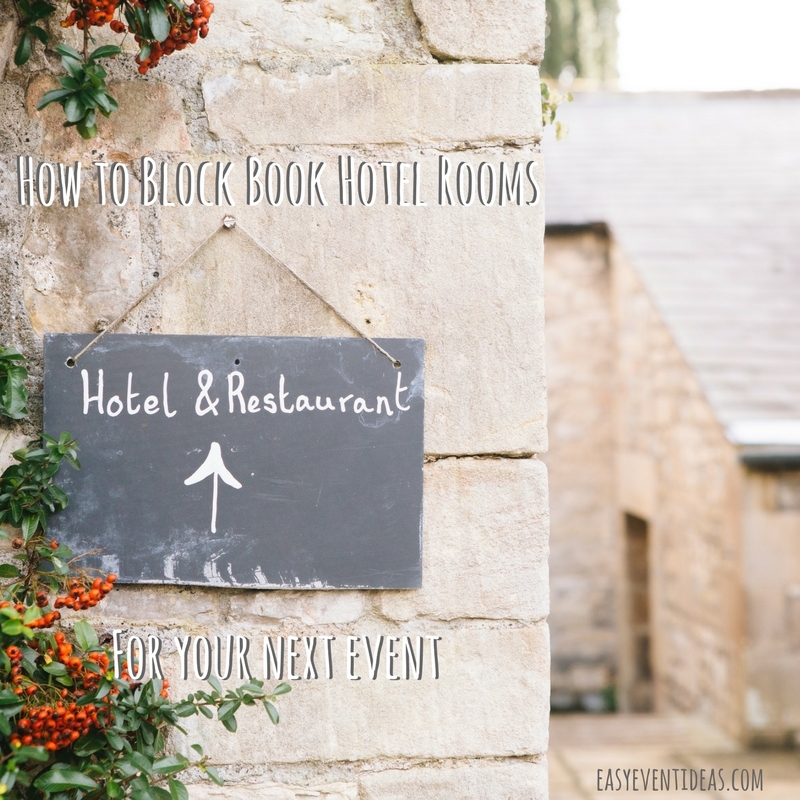 How do you block hotel rooms for a wedding or special event? If you’re having a wedding with a lot of out-of-town guests try to block at two different hotels with two different price points. That way your guests can have a selection of prices to play around with for their travel budget. This is also helpful as hotels might not be able to offer you a big enough block to cover all of your guests. How do you Begin your Hotel Block Booking Process? Start by searching online. Look up hotels that are close to your venue and check out what a normal price is there around the time of your event. Narrow down your search to two or three hotels that meet your criteria. You can then contact their booking managers to coordinate the block. When you call remember to give them the dates you want to reserve. You may want to reserve blocks for a day before and a day after your event if you have out of town guests looking to make a weekend trip out of their travel. You should also give them any special requests like dropping off welcome bags in guests rooms or having them at the desk when they check in. Start by blocking a smaller number of rooms, you can add more later but discuss this with the booking manager they might also allow you to block a larger number and release them as time goes on. Especially if you are booking during a busy season for the hotel, you don’t want to lose spots to other guests. You can also use free hotel room block series like Skipper or Group Travel to do the work for you. They let you search all the major hotels near your venue, helps you negotiate the price, and you can even reserve your block right through them. How do you Negotiate your Hotel Block? Allowable Shrinkage Clause: The percentage of rooms that are allowed to go unbooked. Your target percentage is between 10–20 percent. Which means, if you’ve blocked 20 rooms but 2–4 go unbooked, you will not be penalized with a fee. Attrition Rate or Minimum Commitment: The percentage of rooms that must be filled in order to avoid paying a penalty fee which should be between 80–90 percent. Example: If the entire room block is not used, you’ll owe the hotel damages for all unused rooms based on a minimum commitment of 80 percent. This means that if you do not book the minimum amount of rooms agreed to, you will owe for up to 80 percent of the room block. Mitigation Clause or Resell Clause: The hotel will try to book unused rooms in your block so that you are no longer responsible for them you in essence release them, and they are sold to other customers and there for you aren’t paying for rooms that other guests are renting. How Should you Communicate your Block Information to Guests? The best way to let them know about the block booking options is to include it all in your wedding website. That way they can know all of the information and options available. You can point your guests to your website in your invitation. You can include information such as: please visit our website at http://www.wedding.com to see more information about our wedding and accommodations. It’s also nice to include directions to and from the venue to the hotel or transportation information on the website. It is still winter for a little while longer even thought it’s been in the 50’s and 60’s here in Virginia! So I thought that this week I would show some of my favorite winter tablesapes! Let me know which one is your favorite in the comments or if you have one to share make sure you put yours there as well! I love a natural place-card holder! This pinecone place-card holder and a bare branch, painted white, as a sculptural centerpiece are a perfect addition to the brown and green tones uses in this tablescape to represent a winter feast! 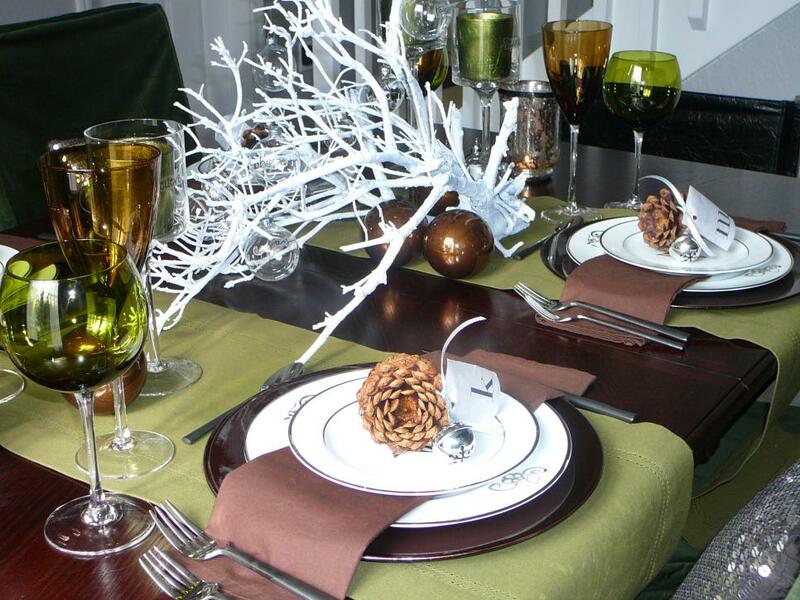 The cranberries, crystal, and gold accents are all beautiful accents to the rustic wood table they are on. I love the use of fruit and vegetables as accents in decorating. Natural accents always a great touch! 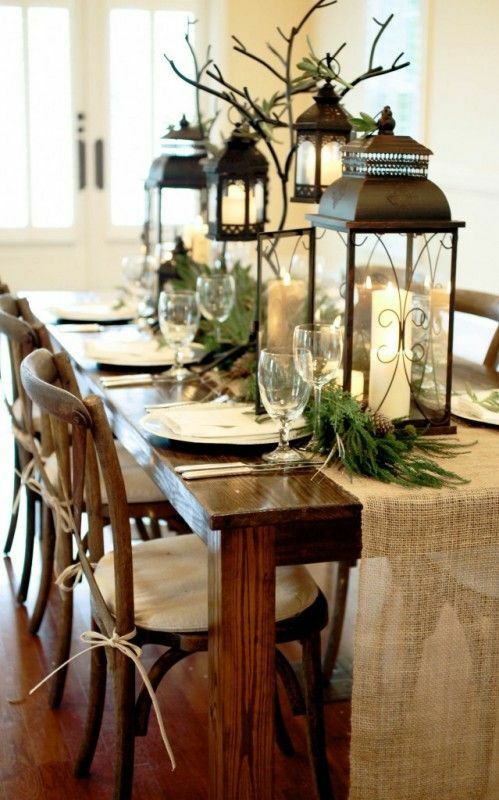 If you have a gorgeous wooden table why would you hide it beneath a tablecloth? 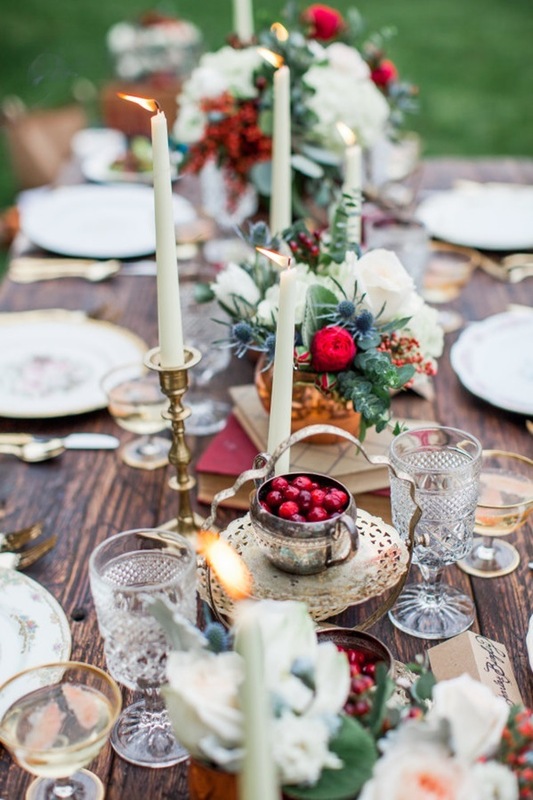 This beautiful table is accented with gold touches and white flowers to bring out some lovely winter hues. 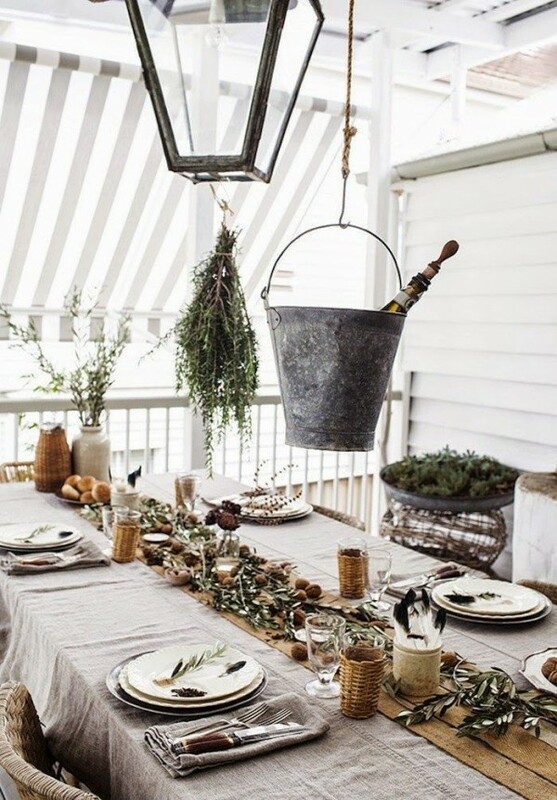 Using dried greens, walnuts, olive branches and linens to create this comforting winter tablescape really bring out the winter hues. And the hanging vintage wine bucket add something special to the design. Again showing off a gorgeous wooden table is the way to go. Accented by a linen runner, natural greenery and these beautiful lanterns is a beautiful way to bring the feeling of winter warmth to your table. It was so amazing to take part in Lizzy and Josh’s big day. Though it rained for days on end and right up to the ceremony beginning, the sky parted just in time for our photo’s and ceremony to begin. We didn’t let the rain stop our outdoor wedding plans we moved from the garden to a beautiful picnic shelter complete with working fireplace and brought the space to life! 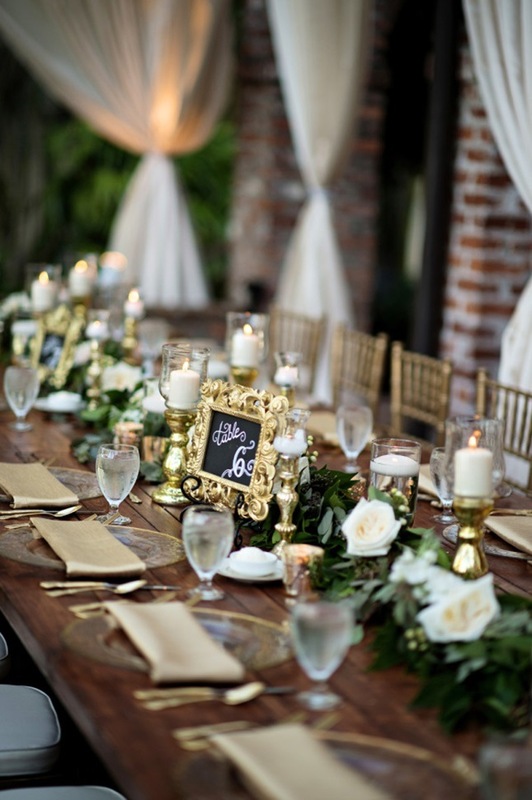 It was an amazing affair with beautiful decorations, setting, and of course bridal party! I couldn’t have been a more perfect day! Usually I post about tips on planning events but today I’m going to discuss some tips on being a guest! Before I do I have a message for the wedding couple. If you’re reading this please understand that by inviting parents of small children and their children to your wedding you need to accept a few things. Their children will be loud, messy, may cry during the ceremony, may get the wedding dress dirty, may cause the couple to need to leave early, will need things like high chairs and food that is different and served most likely before the rest of the guests, and breast feeding moms will need a place to pump or feed baby that is quiet or where they can cover up that is not a bathroom. Be patient and calm with these friends and family with children. They want to celebrate your day and have fun with you but having their baby there will be work for them without a doubt!!! Pack lots of snacks and water to keep them happy. Have them wear a pair of shoes because that floor can get gross fast. We have never had our little one wear shoes before the wedding but since he’s walking we didn’t want him to walk on what could potentially be broken glass without shoes. Stand at the back of the ceremony with your little one to make a quick exit in case of tears or boisterous squeals. Bring a second outfit to change into in case of spillage, poopsplosians, or in case they get to hot. Our little one was in an adorable outfit with a vest and long pants but the venue was hot so we quickly changed him into his equally handsome short sleeve and shorts outfit. Make sure the venue has a high chair for you and a kids meal ready. But again bring snacks because dinner time might not line up with your little ones plans and you don’t want a screamer during the father of the brides speech! Hire a babysitter for the later evening festivities. Little one can make it through dinner and speeches but when bedtime rolls around it’s nice to say goodnight and leave them with a sitter while you head back to enjoy the party! If it’s a summer wedding bring a fan, sunscreen and possibly bug spray for little one. If your little one is smaller bring your stroller or baby carrier in case of naps. Bring lots of quiet toys little one can play with while the ceremony, speeches and dinner are going on. If little one takes a paci (mine doesn’t) bring a few just in case to keep little one quiet. Bathroom facilities may not come equipt with changing stations be prepared to change little one in the car or some other location. Bring extra wipes, extra shirt for dad, something to cover mom, and a tide pen just in case little one makes a mess on you. Bring your nursing cover and hunt down a place to nurse or pump if you need to at the venue. Bridal rooms are usually a good quiet place to go hide away. Ask someone in the wedding party or the venue for assistance. If you’re breast feeding bring pads with you to make sure you don’t leak if your schedule goes array. Also make sure you are wearing a dress easy to BF or pump in. I was in a bridesmaid dress that was not conducive to this and I had to take it off and have my husband zip me back in after feeding my little one. Other notes: Always ask the wedding couple if it’s ok to bring the baby. The invitation should note if they are also invited. Sometimes little ones are allowed at the ceremony but not at the reception so make sure you check. Water Bottle Labels are always a Nice Touch for any Event! I’m a big fan of using water bottle labels. I think they add a special little touch to a normal party item. They are simple and cheap to have made and so much fun! You can have them made, printed and sent to you or you download them and print them yourself. You can have generic ones or customized ones. I have had water bottle labels at both my bachelorette and my baby shower. This shows what a fan I am! I also just designed some that I will be having at my son’s first birthday party! If you are looking for water bottle labels head over to Etsy! Even if you’re not having me design them for you chose from one of the other million mom and pop shops out there, there are a million designs to chose from for every occasion and you’re probably helping out a starving college student or a stay at home mom! There are a lot of great designs out there to chose from!